I am new to machine embroidery and quilting. I want to do a quilt that alternates blocks with a machine embroidered design on them with blocks that will have machine quilting on them. It was suggested to me to use Floriani Batting as my stabilizer under the embroidered blocks. What do you think of this idea? Would I then use a batting to cover/sandwich the whole quilt? I am confused, any help or ideas would be greatly appreciated! Hi Lori! What a wonderful way to showcase your machine embroidery designs! I love it! I stablized the fabric with a woven tricot fusible interfacing, crossing the lengthwise grainlines. Once the interfacing is fused to the back of the fabric, the fabrics LW grain goes top to bottom and the LW grainline of the tricot fusible goes side to side. The provides a very stable fabric to embroider on. The fusible was just a smidge smaller than the oversized square of fabric—that way I didn't gunk up my iron. After embroidering, the quilt block is cut to size and stitched into the quilt top. It it then layered with backing and batting, basted and machine quilted. The 'Kitty' quilt was the result. 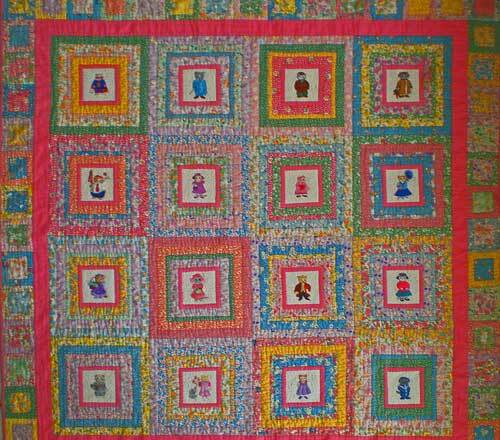 I've made several of these types of quilts—they make a nice baby quilt to gift. I'm assuming that the embroidered blocks are the 'stars' of your planned quilt. You'll want to give them more emphasis with either brighter or higher contrast threads and machine quilting that complements their design. Heavily quilted areas will visually recede. That why quilters put a lot of background quilting behind applique. The applique visually 'lifts up' from the background. If your embroidery designs are high-stitch count like the Kitties, and you planned to put very little quilting around them in the same block, your background could literally end up higher than the embroidery with the batting as stabilizer. Those high stitch-counts compact the batting more than the quilting. Sandwiching with another layer does nothing to improve the situation. High contrast with the embroidered blocks, i.e. if the embroidery is curvy, then grid quilting for sure. Not knowing what the designs are like makes it hard to give a definitive answer. Make a sample stitch out. If you're uncertain as to what to expect, this is the best recommendation. You'll know for sure if you like the finished quilt before it's finished. I'd do a sew-out of the embroidery, piece it to the alternate block and then quilt the whole thing. If the finished quilt will be used on a bed, lay the sample horizontally; if it's meant for a wall, then vertically. Live with it for a few days. But you'll spend a considerable amount of time between the embroidery and quilting. Getting it right for you is well worth the effort! I hope this has helped in your decision making. Your own eyes will tell you what you like best. Depend can depend on them. Readers, your comments and suggestions are appreciated. Just use the comments link below to share. I have read Julie's comments, and I think I am more confused than ever. Sorry :(. I am making an art quilt. There will be two different types of blocks in the quilt design to include 1- Fused Raw Edge Applique and 2 - Embroidery. On the Fused Raw Edge Applique I may or may not want to do stippling in the block, but it wont be in every block. These are being designed as art quilts only and should never see a washing machine, but one can never tell, so I want to be safe. 2 - If I am to use batting as a stabilizer, which one is the right one and do I add another layer when I am batting and backing the entire quilt when finished? Hi Shannon! I'll see if I can provide some clarity. There'll be two layers of batting behind the embroidered blocks. I don't want the extra puff and thickness. If you embroider over a batting stabilizer and then put little quilting in the background of the design, there's a good chance that the background will visually come forward. Literally the embroidery is pushed down into the batting. I prefer to embroider the block first, layer and baste the sandwich and then quilt. The more heavily quilted areas recede so I can choose to emphasize what I want in the quilt. As far as stabilizers go, I've always used Sulky products with a few from Viking through in for experimentation. How dense is the embroidery? Do you want a fusible stabilizer? Do you want to leave it in the quilt or wash, tear or cut it away? Compare you needs with the available stabilizers that you're interested in or own. Then stitch a sample to be sure. If the sample comes out great the first time, it goes into your quilt. Im really more confused now... is the answer a yes or no? What I don't understand about quilting with embroidery machine is what do you do about the back, because obviously is quilted along with the front unless you dont put the back material on and just use batting and stabilizer, then wgen you do the back arent you double quilting? Sorry for the confusion, Shirley. Without examples of the designs the reader intended to use, it's hard to answer specifically. 1. Stabilize the fabric for embroidered blocks with a fusible, knit tricot interfacing—I got mine at Joann's. 2. Press and trim to the size patch I need. 3. Piece the embroidered patch(es) into the quilt top. 4. Finally layer and baste and quilt as usual. In the original question, the reader wrote that she would machine quilt the alternate squares. I assumed she meant she would do this quilting with her domestic sewing machine—not with a design in her embroidery machine—that her embroidered blocks would be something like the 'kitties' shown in the example quilt. If she were to machine quilt with her embroidery machine, she would want to do it on a sandwiched quilt top, batting and backing. This would be the case whether she was quilting the entire quilt in one piece or if she was quilting individual blocks and then using a 'quilt as you go' technique to assemble the quilted blocks into a finished quilt.